And a few ingredients. This recipe calls for sugar, water, butter, cream, and salt. Das IT! You may add vanilla or bourbon at the end, but if you’re watching $$$ and not trying to spend a lot, the sauce will be just as dreamy minus the vanilla punch. Promise! That said, I sometimes add a little splash of Madagascar bourbon vanilla and HOLY SMOKES is it good. This recipe was updated on 10/22/2018! In a small saucepan over medium-high heat whisk together sugar and water and bring to a boil. Cook until sugar has dissolved, about 1 minute. Reduce heat to a simmer. Add in butter and whisk until combined. Simmer until the mixture turns a deep amber color, about 5 minutes. Remove from heat and carefully whisk in the cream (it will bubble up ferociously after you add it!). Whisk until well combined. 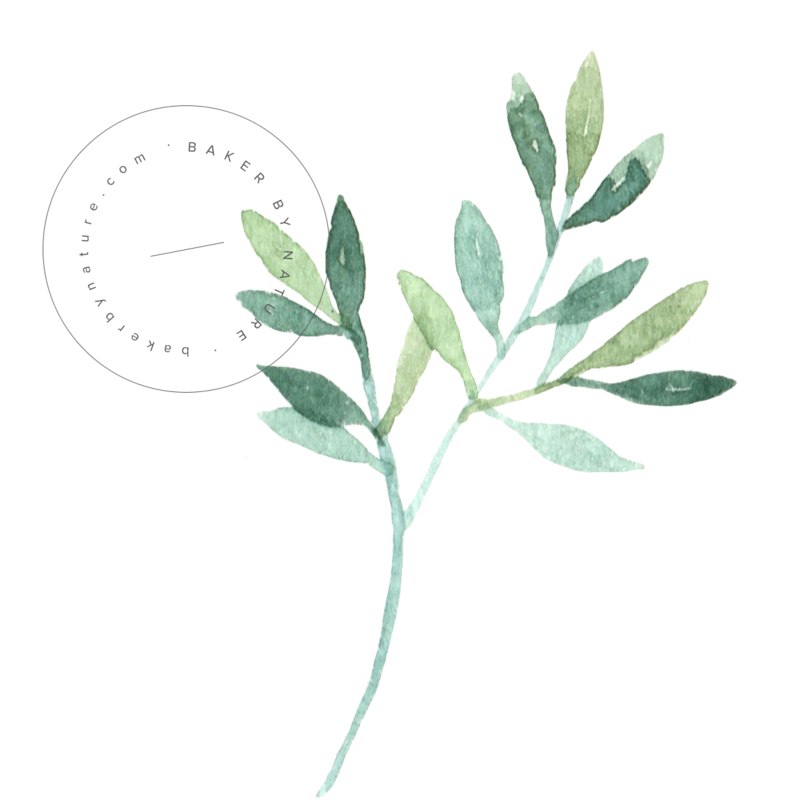 Whisk in salt. Pour caramel into a heatproof jar. Allow it to cool a few minutes before using. I saw this on IG and had to hop right on over! Yes to caramel sauce on everything. I’ve never made it with brown sugar (only white sugar) but now I’m super duper excited to try brown sugar. I bet the flavor is amazing! Yeah! Y is my caramel always gritty when my caramel gets cold no matter what sugar I use? And do u refrigerate unused caramel,cuz mine again is gritty,help! Hi, mine is also gritty. When it was fresh it was awesome, but as it cooled it became crystallized. I was hoping to use it cooled on top of a cheesecake. Any recommendations? Hi Marie. This small batch salted caramel is best served right away. I’m working on a recipe for a more stable caramel sauce and hope to have it up soon! I made a double batch of this recipe. It was sooo good. My daughter and I had to make another batch to replace what we had spooned it to our mouths (for tasting purpose only). Anyway after it cooled I put in the fridge. I made a box carrot cake cut into cubes. Then made cream cheese icing whipped with whipped cream. Cut the cake in cubes and layer with the cream mixture, the new walnuts and this salted caramel. I just reheated for 1 minute and stirred. Heated and stirred. Not to warm so it didn’t spoil the cream mixture. It was still a little gritty but in this receipe. You couldn’t even taste anything but the delicious Carmel. I got this carrot cake truffle recipe on Pinterest. I wish I could go back to see the name. Anyway this receipe is Awesome!! SO happy you enjoyed it, Jennifer! The truffles sound amazing! Are you using a metal whisk? Because I was always told to stir with a wooden spoon to avoid the sugar to form lumps. Hi Rik. I have always used a metal whisk (or a silicon covered metal whisk) with no issues, but feel free to use a wooden spoon if you’d like! After reading comments about gritty texture – I decide to make a hybrid of Ashley’s recipe and what I know from make caramel the traditional (time consuming) way. Then I added the cream. 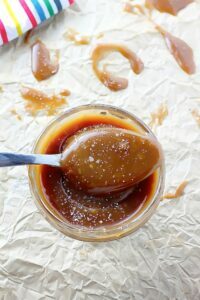 If you haven’t made caramel before BEWARE that when adding the cream to the sauce after it’s been boiling will cause everything to bubble up quite a bit. Just keep stirring. I cooked this for another 3-4 minutes. Removed from heat and added vanilla as directed. My total cooking time was about 10-12 minutes, yet still very minimal compared to normal caramel making. I didn’t want to post until I had regridgerated and taken out to use. But I’m happy to report NO gritty texture. Thank you Ashley for posting a way to make a quick small batch — was perfect for my need. How long do you think it would be safe to refrigerate this? I usually make homemade caramels for my neighbors and daughter’s co-workers but this year I’m recovering from a lumpectomy I had on Dec. 17. Not wanting to let down my neighbors, I found your recipe on Pinterest and decided this was doable. I can stand and stir small batches for the 6 minutes, no problem, and the sauce is absolutely yummy! (I’m dipping my healthy apple slices in it!) My gift won’t be full blown caramels but my friends & neighbors will get a sweet taste of the holidays with love! Thanks! Hello 🙂 I love that the recipe is a small batch–I’m planning on making cheesecakes in mini mason jars so this is perfect! Does this recipe still work if I use white sugar? How will it affect the flavor? (This is my first time making caramel sauce, btw). How long does it last unopened and opened? Thank you for this easy ans extremely delicious recipe! Can I puhleeeease bathe in this? Because OMGITS’AWESOME. And the sprinkling of salt on top is just ridic. I have made it the old fashioned way and it’s so tricky! This is WAY better and so fast. Love it!!! 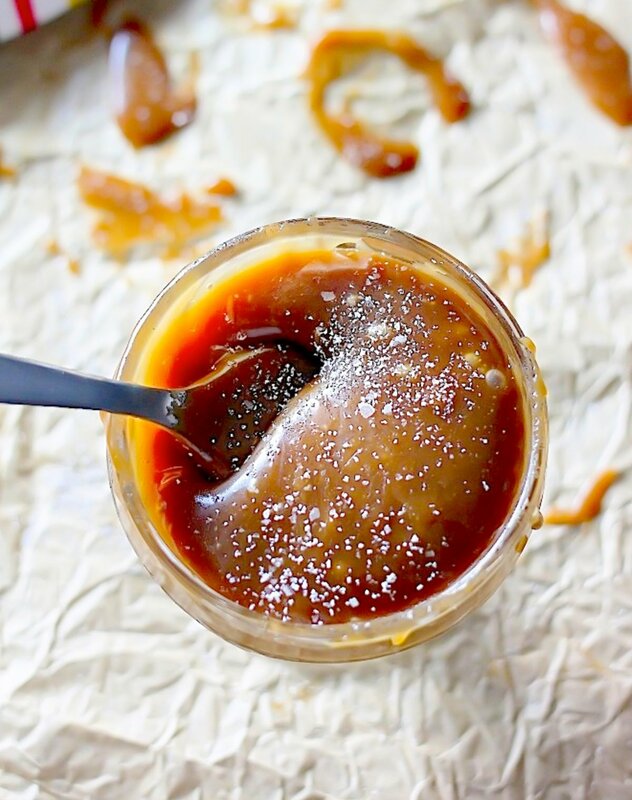 Would love to make this salted Carmel sauce for gifts for my staff. What size mason jar and when it’s cooled, can it sit out or does it need to be refrigerated? Hi Kathy. I use very small mason jars as this is a small batch (for two) caramel sauce. It should be refrigerated until needed. curious why does it need to be refrigerated? I have for years and years made caramel and I make it all the time and never refrigerate it. I sometimes use preservatives due to when I am making it like if between Christmas and Valentines. I make sauce and harder pieces to dip in chocolate. I also have heard to squeeze some lemon in it to prevent crystalization but it curled a batch I did so I never tried it again wondering have you? Thank you, just made this for Sourdough Bread Pudding! Yes, it is amazing. Can I use regular cream, not heavy cream? I definitely will try this! I always buy unsalted butter. Do you have any idea how much salt I should add if I use unsalted butter instead of salted butter as shown in your recipe? Thank you. Hi Sue. I would add 1/4 teaspoon or a 1/2 teaspoon of salt, depending on how salty you like your caramel 😉 Enjoy! It is truly amazing and a great time saver! I made it with half and half cream (10%) it turned out fantastic. Thanks for posting this recipe. I’m about to indulge in my small batch of salted vanilla caramel. I can’t wait! Thanks for posting this recipe! Update! It is fabulous! Super yummy still though I imagine butter would be better. Hi Kristin. While I’ve never tried canning itself, I don’t see why you couldn’t can it. I made this the other day…fabulous! I included a link in my new post for a salted caramel apple crumb bars. Thanks for sharing! Hi Shenetia. I use light brown sugar in this recipe. Hi, i dont have bourbon, but i do have some dark rum or even Bailey’s. Have you ever tried it with one of these? H Kim. While I’ve never tried using dark rum or Bailey’s, I think it may work. Please keep me updated if you try it! Hey Ashley, just thought I’d let you know that I tried this with the vanilla cinnamon Bailey’s and it was awesome. Served it with some apple pie fries and whip cream and it was a hit at my potluck. Thanks for the recipe! Kim – thank you so much for letting me know 🙂 And I’m thrilled to hear it was a hit. I need to try it with Bailey’s asap! Super yummy and super quick! Thank you for a great, no fuss caramel sauce. So I just tried the recipe but my Carmel came out very thin and runny, any suggestions as to what I did wrong? It did take 3 or so minutes longer to get it to boil even on medium-high heat. Could that have been my issue? Hi Elizabeth. I’m sorry to hear your caramel didn’t turn out. It sounds like it didn’t cook long enough, although it’s hard say exactly what the issue was without being there myself to see it. Your burner may run a little cold, so next time I would recommend boiling it a little longer. Amazing though and turned out spectacular, I could drink it!!! Can I use regular sugar instead of brown sugar? My brown sugar is very coarse, i wouldn’t want the end result to be gritty! Hi Mie. Yes, using granulated sugar should work just fine. I can I use this receipe for frosting for carmel cake? Hi Ann. I’ve never tried incorporating this caramel into frosting, so I’m unsure. We typically use it for drizzling over ice cream, scones, cookies, etc. It does need to be reheated after sitting a while, as it does “set”, so that may be an issue in your frosting. If you give it a try, I’d love to hear how it turns out. Can I just double this for a larger batch? I was wondering the same thing! I made it this morning and it only filled a small jar about 3/4 full. Have you ever doubled it? Super easy! I tripled the batch and filled a 12 fl oz jar to the top. Thank you for a great recipe! Merry Christmas! Hi Kristin. While I have never doubled it myself, a few readers have let me know it worked for them. If you try, I’d love to hear your results. Happy holidays! Hi Mary. While I have never tried doubling this recipe, a few readers have with success. If you try it, I’d love to hear about the results 🙂 Happy holidays! Just made this to pour over chocolate and cinnamon brownies……..my god its good !! This looks fantastic! Those of you that doubled or tripled it, did you increase the cooking time, and and by how much? Made this just now and its amazing! Thank you for the quick and delicious recipe! Would coconut sugar work instead of brown sugar? Hi Debbie. I’ve never tried this recipe with coconut sugar, so I cannot say for sure. If you try it, I’d love to hear how it turns out! I just made it with coconut sugar and it is delish! Yay! Thank you for letting us know, Laura! OMG! This is pure evil genius! Simple and amazingly delicious! I tried this recipe. Made it with unsalted butter and then 1/2 tsp of flaky sea salt. It was awesome!!! However the color of my caramel is a bit brownish rather than amberish like yours… Should i have heated it a bit more? By the way, because this recipe has no water, the caramel will solidify in the fridge. It’s really best to consume right away… Heating up solidified caramel will make the oil from the cream separate which you would be frustrating. Nevertheless it tastes good fresh! I was making chocolate caramel marshmallows. Can I use this caramel to put on the marshmallows? Will it harden enough to add the chocolate and not drip off? So happy to hear it, Alexander! Yum! One of my favorite ways to eat this sauce. I just made this and it was super easy, and taste amazing. I’ll never buy store bought again. Thx for sharing. Amazing recipe! I always dread salted caramel for the temperature watching and cream overboil. This was unbelievably easy and the perfect flavor and consistency. My new go-to. Thanks for sharing! Will this recipe work with whipped cream/cool whip? Hi Savannah. I do not believe it will work will cool whip. I suggest using plain heavy cream. Sounds delish!!! Just wondering how long will it keep for in the fridge pls? Hi–this is still on the thin side. Does it thicken up when it cools? So, I made this and the first time it did not turn out. However, I made it a second time adding in the half and half and butter in slowly and it worked just fine! Thank you for this amazing recipe! Can you make this a double batch and still come out just as good? I need alot as Im making a huge cake! Hi Holly. While I haven’t tried doubling it myself, many readers have reported it works! Thank you sooooo much for this recipe. Made it for my boyfriend a couple months ago…needless to say I have made about 10 batches since. He is addicted lol. And yes you can double the batch…I now double it! Just made this to put on cheesecake bars…..holy balls this is amazing. I did use dark brown sugar and my dash of vanilla turned into a splash but lick the pot good. Thanks for the easy recipe!!!!! Is this caramel good for making turtles? Does it thickens enough?? Hi Paola. I’ve never tried making candy with this recipe. Typically I use it right away, since it’s such a small amount. Ok so I tried the Bobby Flays salted caramel and I thought it would be perfect. But it is nothing compared to your caramel sauce!!!!! You are the Queen of Caramel!!! It was so much easier and tasted incredible. Thank you for changing the way I make caramel. Does this recipe make enough to use with your German Apple Cake? I’m making it for book club tonight, and thought the recipe looked great. Just need to know if this small batch is enough to to drizzle over the whole 9″ cake. Thank you! Wow, this is fab with pannacotta. But it’s actually butterscotch, I though butterscotch and salted caramel taste a bit different. A bit of googling and it does seem more of a butterscotch but kept pourable. 5 stars for the recipe! If anyone likes orange flavored caramel, try it with Grand Marnier.Wow! Made a double batch today for a pot luck. Terrific. Definitely a keeper. I made this yesterday and I couldn’t stop licking the spoon! I did use sea salt instead. The sweet and salty was perfect! This is going into my macaron filling with vanilla buttercream. Thank you so much for this recipe! Fast and easy! You’re very welcome! 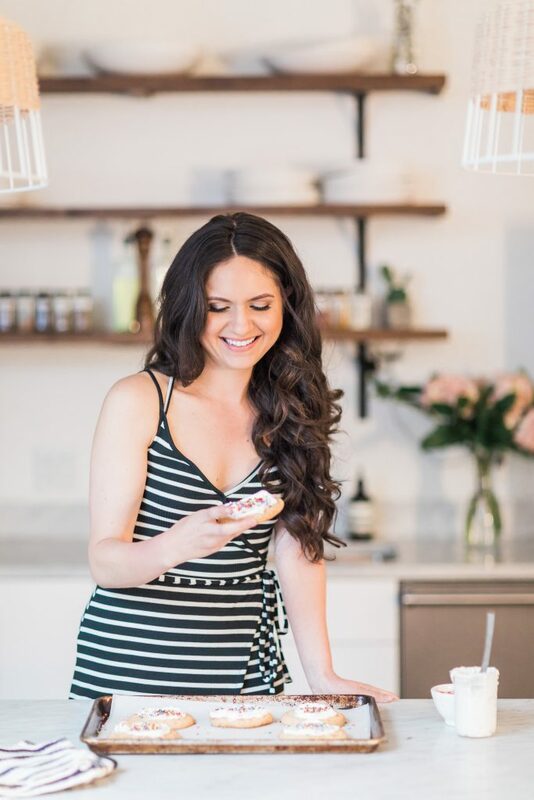 So happy it was a hit – and those macarons sound AMAZING! OMG tnis is amazing. I made it for your chocolate sslted caramel cake for my daughters birthday. I hope I have enough caramel for ths cake LOL. I had to put my spoon in the dishwasher so I’d quit “sampling” it. I refrigerated it over night & it’s not gritty. Not sure why others are getting grit. Anyway, this is easy & amazing. I will never buy carmel sauce again. Thank you. 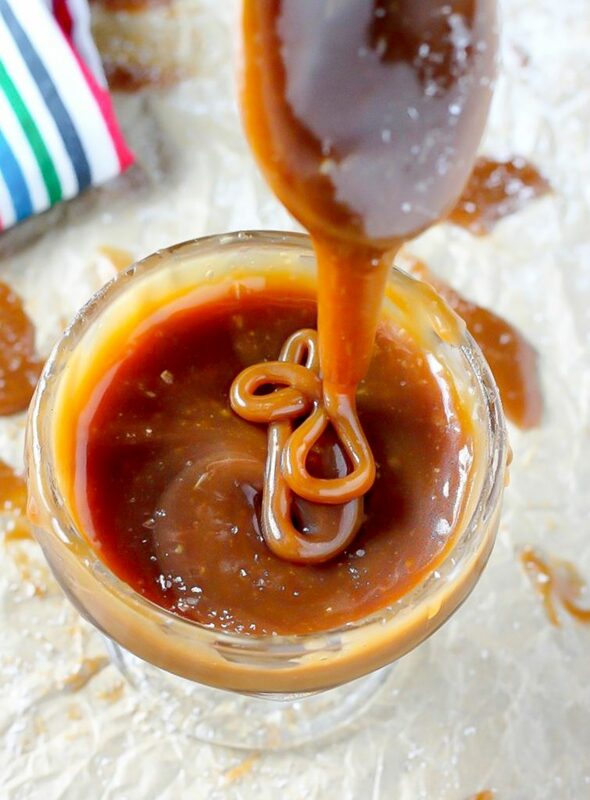 This is the best and easiest salted caramel recipe I’ve tried. Thank you for sharing! And just in case anyone else is wondering, I just tried it with a lighter cream(18%) because I didn’t have any whipping cream, and it turned out fine! Excellent! Soooo good, made a double recipe and it yielded one cup total. Thank you for this easy simple recipe. Will this caramel pour over a cheesecake and set? And not become too hard but not drip off? Are you KIDDING ME?!!!! This is the easiest and yummiest caramel I’ve ever made. Ridiculously delicious. Thank you so much for this awesome recipe! I made some caramel with another recipe the other day and burnt it a little. I feel like this recipe is basically fail-proof. Hi, i made this caramel yesterday for the first time, and it did have a bit of a gritty texture, i refrigerated it and this mornig when i went to check it out, it was hard as rock. is this normal? can you please help me understand why this happened? Amazing! I used dark brown sugar because I like that intensity. So easy and so good! It counts as breakfast, right? Nice simple recipe. Easy to make and quite tasty. I used Celtic Sea Salt instead of kosher. Flavor if perfect for what I am using it for, a mixing for homemade ice cream.cant wait to try it all together. I came here to ask the same thing! Can you use kosher salt? I’ve just made your caramel recipe but I’m confused as to type of sugar to use. Your recipe on Pinterest says gnulayed sugar but when I read your comments from others they talk about brown sugar, so which do you use?